Focused and concise, yet comprehensive in scope, this text provides essential, practical information for solving surgical problems commonly encountered on rounds, in clinical situations, and in surgery. In more than 100 chapters, the expert contributors propose key questions and provide answers to solve these situations that confront practicing small animal veterinarians every day. 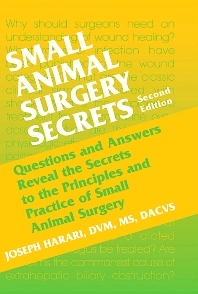 The text begins with general concepts of surgery, including anesthesia, minimally invasive surgery, and wound management, followed by sections devoted to soft tissue, orthopedic, neurologic, oncologic, and oral surgery written by a diverse group of expert contributors from academic, private, and industrial practice. Concise answers with valuable pearls, tips, memory aids, and "secrets"